In a showdown between two of the region’s top teams, Desert Hills defeated previously unbeaten Snow Canyon at home Thursday evening, 3-1. Desert Hills won the first two sets, 25-21 and 25-18, but the Lady Warriors came back to win the third set, 25-18. The Lady Thunder prevailed in the fourth, 25-20, to take the match. Kamryn Bliss led the Lady Thunder with 22 kills, while setter Emma Jacobsen had 16 assists. Andie and Halle Sonju each served up six aces. Also Thursday, the Dixie High Lady Flyers defeated Cedar at Dixie in a hard-fought match that went five sets. Dixie lost the first two sets 22-25 and 17-25 but came back to win the next three, 25-18, 25-13 and 15-11. Halle Anderson led the Flyers with 20 digs, while Aubrey Coffin and Emilee Nelson had 12 kills apiece. Tuesday evening, Snow Canyon hosted Dixie and beat the Flyers in a five-set match. Sammi Johnston led the Warriors with 17 kills, while Jael Wilde had 16 digs and Lizzie Rowland had 20 assists. 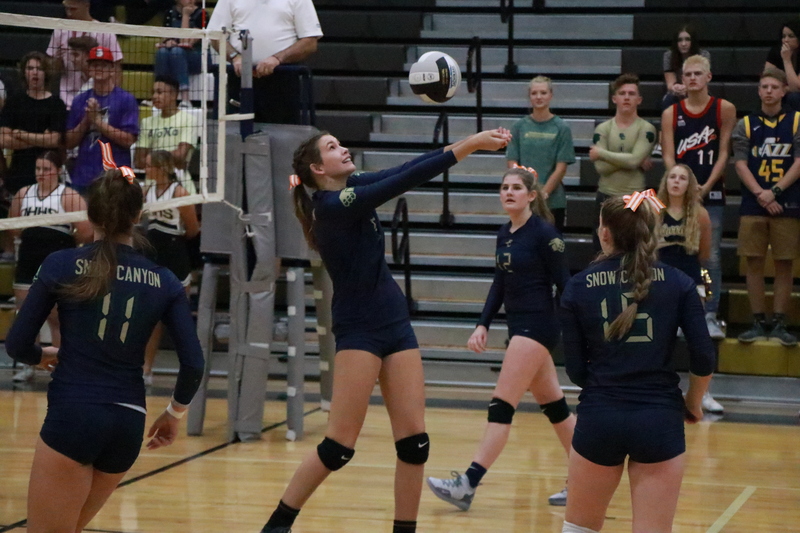 Katie Langford added 12 kills and seven blocks for Snow Canyon. In a wild game Tuesday afternoon at Cedar City, Desert Hills outlasted the Cedar Lady Reds 3-2 in overtime. The Lady Thunder had taken a 2-0 lead by halftime, with Kenzie Woolley and Kiki Stewart each scoring a goal for Desert Hills. Then with approximately 25 minutes remaining in the second half, Cedar’s Logann Laws kicked a goal high into the net from the left side to make it 2-1, and with less than two minutes remaining in regulation, Cedar’s Kelsi Oldroyd followed up with a game-tying goal from close range. In the sudden-death overtime period, Cedar managed to get an early shot on goal, but Desert Hills ended up being awarded a penalty kick a few minutes later. Stewart’s PK attempt went to the right of the net, almost to the corner, but Woolley chased it down and brought it back around, passing it to Tanayia Crosby, who kicked it into the net for the game-ending score. 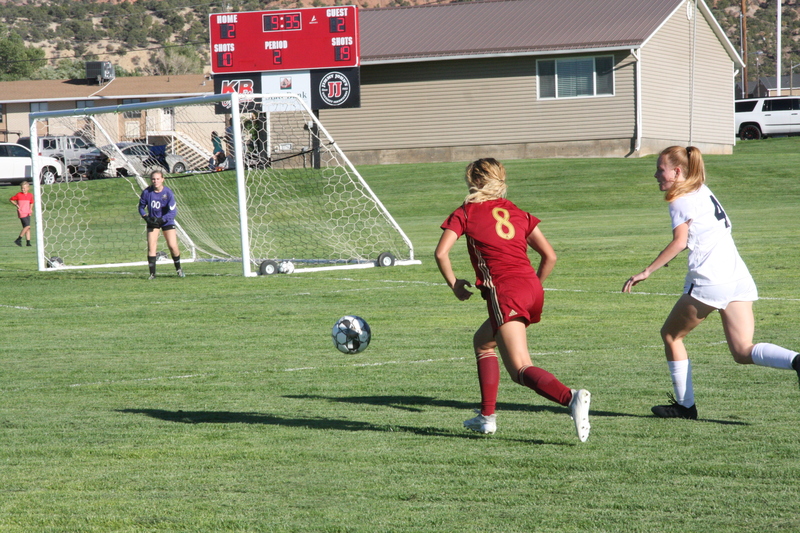 The Lady Reds played Pine View at Cedar Friday afternoon, which was a rescheduled contest for a game that was postponed last month due to weather. 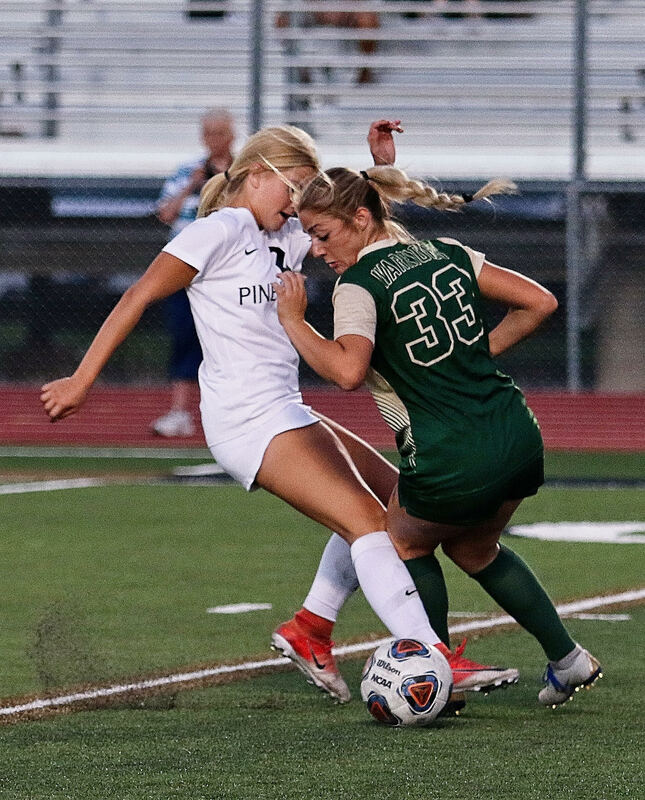 Pine View led 1-0 much of the game, but Cedar’s Laws scored in the final two minutes of regulation to force overtime, during which Becca Boyer knocked the ball into the net off a corner kick to give Cedar the 2-1 win. The same two teams will play each other at Pine View this coming Tuesday. Last Tuesday, Snow Canyon defeated Pine View 4-2 at Snow Canyon. Senior Ashley Brindley scored all four of Snow Canyon’s goals. Hurricane High School’s boys and girls cross-country teams both took first place at the Hurricane Invitational Wednesday at Sand Hollow Golf Course. Sophomore Joshua Armstrong of Hurricane was the top male finisher with a time of 15:56. Two other Hurricane runners, Bryce Thomas (16:29) and Tim Amodt (16:36), placed second and third, respectively, out of about 36 athletes who completed the race. In the girls race, Hurricane, Canyon View, and Cedar each had two runners place among the top six finishers. Junior Hailey Odekirk of Hurricane took first in a time of 19:29, while freshman teammate Caila Odekirk placed third in 19:45. Canyon View senior Lizzie Ware finished second in 19:45, while Malayna Steffensen of Canyon View, a junior, placed fourth with a time of 19:54. Coming in fifth and sixth, respectively, were Cedar seniors Kaysie Klemic and Harley Taylor. Pine View placed second as a team in the girls race and third in the boys. For complete results, click here. The next scheduled meet involving Region 9 teams is the Canyon View Invitational in Cedar City on Saturday morning starting at 8 a.m.
At the fifth Region 9 match of the season Thursday at Sky Mountain Golf Course in Hurricane, the Desert Hills Thunder had a sub-300 score for the third straight week to once again take first place. Desert Hills’ Ashton Davison fired a six-under-par score of 66 to lead the way for the Thunder. Pine View’s Lucas Schone was the individual runner-up with a score of 71. Yash Vyas of Dixie was third with a 74, Desert Hills’ Cruz Kirchhausen was fourth with a 75, and Curtis Matheson of Desert Hills and Jack Phillips of Dixie were tied for fifth with scores of 76. Next week’s match is Wednesday at noon at Cedar Ridge Golf Course in Cedar City. The Desert Hills Lady Thunder finished the regular season undefeated, thanks to a 5-0 win over Pine View on Tuesday and a 4-1 victory at Dixie on Thursday. Of the three winners of last week’s regular-season Region 9 openers, two will be on the road Friday night, as Dixie travels to Snow Canyon and Desert Hills visits Hurricane. The latter contest marks the season opener for the Tigers, who had a bye last week after going 0-3 in preseason play. 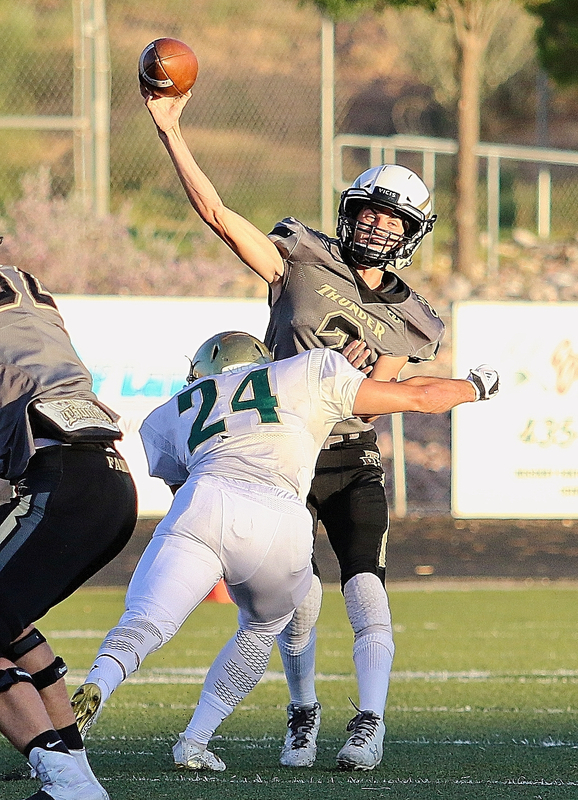 Meanwhile in Cedar City, cross-town rivals Cedar and Canyon View will both be looking for their first region win when they play each other at Cedar’s home field, starting at 7 p.m. Check back on St. George News / Cedar City News following Friday night’s games for scores, photos, summaries and other details. Pine View, which beat Canyon View 70-26 last week, has a bye this week and will next play at home vs. Snow Canyon on Sept. 21.